Norway, in our opinion, has the most beautiful natural scenery out of any country in the world. If you don't have the time to read our post, just spend 20 seconds checking out the photos below to get an idea of the incredible natural beauty of Norway. We were lucky enough to visit Norway in summer (July) and had perfect weather, not too dissimilar to central Europe in summer; temperatures ranged from 20 to 30 degrees Celsius. Get active in Nick's favourite place in the world... The Lofoten Islands, in Northern Norway. Before we go into the itinerary in detail, here's a bit on the best way to get around in Norway. Driving by car! A driving holiday in Norway is an experience of a lifetime. Norway has the most incredible scenery - most of it accessible by car or a short hike from the car! Unlike a cruise or train travel, you are a lot more independent and can stop (way too often) for photos or to simply soak up the surrounding scenery. Norway is expensive; there is no way around it. It's best to embrace it and deal with the pain later. Having said that at the time of writing the the Norwegian Krone has dropped significantly to most other major currencies making it one of the cheapest times to visit Norway in the last 30 years. Having already established that Norway is expensive, car hire is very expensive but so worthwhile. Forget one-way travel with cars, the price to pick up and drop-off in different locations is crazy (we are talking $1,000's), but return car hire is not unreasonable. Also, Norway is a vast, mountainous country and driving times are long - be prepared for several hours in the car at once. HOWEVER, we feel that driving for 5 or 6 hours between places in Norway is an experience in itself. Norway's infrastructure is incredible: massive tunnels going for kilometres at a time, winding roads over high mountain passes and bridges over the waves of the Atlantic ocean. Finally, Norway is incredibly safe - roads are very safe, well signed (it would be hard to get lost) and the people are friendly and always willing to help. Driving along the E10 in the Lofoten Islands, Norway in 2015 was one of the most amazing experiences of my life. A must do for any nature lover. The following itinerary is perfect for a first visit to Norway - it takes in a sample of some the best places to visit in Northern and Southern Norway. Due to the incredibly long distances (it would take over 24 hours to drive from Oslo to the Arctic Circle), the trip is separated into two road trips - Northern Norway and Southern Norway with a flight in the middle connecting the trip. The itinerary discusses the absolute minimum time required at each destination; in most cases we would recommend spending a few extra nights. Flying above the island of Svalbard at 2am on our way back to Tromso after our second aborted landing (we never made it to Svalbard due to the low lying fog!). It was amazing seeing so much light at 2am. Start your two week Norway road trip by flying into Tromsø. Tromsø has a well serviced airport and there are quite a few flights per day with Norwegian Air from Oslo, and even direct flights from the UK. Tromsø, which is about 350 km north of the arctic circle, is the northernmost city in the world with a population greater than 50,000. From 19 May to 27 July, Tromsø experiences the midnight sun (i.e. the sun does not go down!) - the below photo was taken in Tromsø at midnight. To get your bearings take Tromsø's cable car up to the top of Mt Storsteinen to experience terrific views of the town and the surrounding fjord land (Tromsø is actually an island in the middle of a fjord). Interestingly, whale was served as part of the 'red meat' section and not the seafood section. We tried it once but probably wouldn't do it again. Visit the polar museum if the weather is average - it actually had some very interesting information about Roald Amundsen and other explorers who used Tromsø as a base to conquer the North Pole. This won't be for everyone but if you wanted to try whale (whale in Norway is a tradition and is not illegally caught), Tromsø is the place to do it. If whale doesn't sit right with you there are many other traditional hearty meal options for you (like seal or reindeer). You could spend the full two weeks of your Norway road trip in Lofoten with no troubles at all. Drive from Tromsø to Svolvær, the largest town in Lofoten. It takes 7 hours to drive along the E8 and E10 but it is an amazing drive as you cross over onto different islands via bridges from the mainland. Svolvær is located on the island of Austvagoy and is the largest and most vibrant town in Lofoten. There are several peaks that can be climbed and there are many ferry/boat options to neighbouring islands; we suggest a ferry to the picturesque Skrova Islands. In the evening you can relax at one of the many waterfront restaurants and try one of the local beers. Though if you want to save money, stay clear of alcohol - it is ridicoulously expensive! Today drive down to Leknes which is the perfect base to launch yourself into hiking, kayaking and cycling throughout the most beautiful stretch of the Lofoten Islands. We could have easily spent our whole holiday in this part of Norway but as a guide, we would suggest three nights minimum. Today drive down the E10 to the village of Reine, which is the ultimate postcard town with the most stunning scenery you could imagine. The village is located on the island of Moskensesoya and is a 1 hr drive from Leknes. The village is simply breathtaking with white and red fishermen houses along the shoreline and the mountain peaks providing the perfect backdrop. 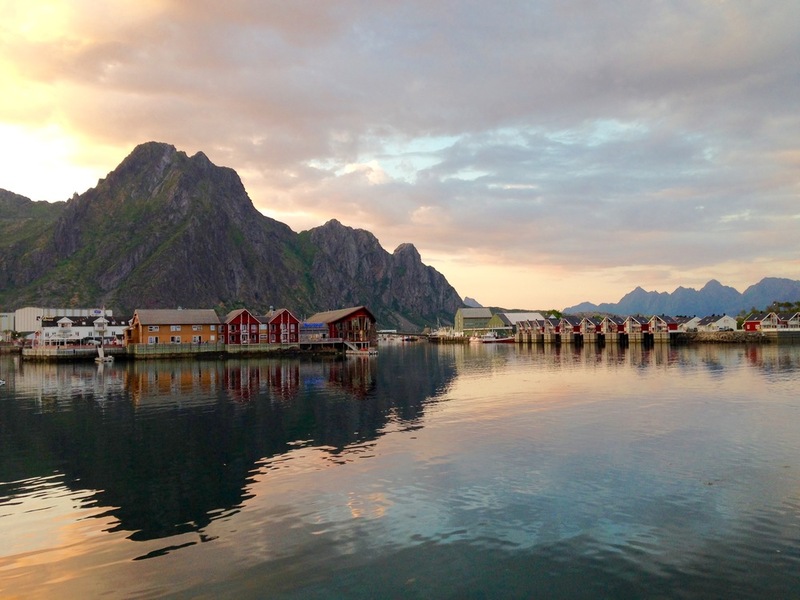 Reine is a sleepy village but it cannot be topped for natural beauty. For more on Lofoten visit our article dedicated to the most picturesque place in the world! Reinebringen; every hikers dream! Located just outside the picturesque town of Reine, the hike up Reinebringen is the absolute highlight of a trip to Lofoten. Reinebringen itself stands at a modest 450m but the panoramic views from the top are unparalleled. The hike is short but strenuous as it is up a very steep incline. To get there, park at the top of the turnoff to Reine on the E10 (in a small parking area). From Reine walk west on the E10 towards the town of Å. There is a paved path that goes around the first tunnel you meet, walk down there and just before you meet the E10 again there is a small trail which emerges from the tunnel. You will not be disappointed - if you are visiting Norway during June and early July try walking up Reinebringen at midnight to experience the incredible views with the midnight sun! Drive from the Lofoten Islands to Tromso (a long drive, but that's Norway) and drop the car off before flying back to Oslo. Spend the night in Oslo relaxing and recharging before a long drive tomorrow. If you have some energy head out to one of the many interesting museums and galleries- the National Gallery was our favourite. Bergen is just under a seven hour drive from Oslo. The roads wind over and through mountains and there are plenty of photo opportunities along the way. Bergen is the gateway to the Norwegian Fjord lands and Norway's second largest city which makes it a great base to explore Norway's fjords. Bergen is also one of the mildest cities in Scandinavia in terms of temperature and it is not uncommon to see a temperature differential with Oslo of 20 to 30 degrees Celsius. Bergen's Bryggen, or wharf, is a UNESCO World Heritage Site and is apparently what Bergen looked like in the 1300's with its narrow alleys, markets and colourful buildings and is definitely worth a visit - even if it is just for the delicious seafood in the alfresco market. Today, take a day trip down to the spectacular Lysefjorden which is famous for Pulpit Rock. Pulpit Rock is one of the best places for a photo as it sticks out over the fjord giving amazing views and with a fall of nearly 600 metres on either side, can make most of us slightly nervous. In the evening, climb or ride the Fløibanen funicular railway for breathtaking views of Bergen from the top Mt Floyen. The Geirangerfjord is one of two UNESCO World Heritage listed fjords in Norway (the other being Nærøyfjorden near Sogneford). Geiranger, in our view, is the most beautiful fjord in Norway with a narrow passage through the Norwegian Alps, water falls running down the side of the mountains and abandoned farms either side of the fjord. The six and a half hour drive from Bergen to Geirangerfjord winds around fjords and over fjords and is one of the highlights of the trip. There is one ferry that you will have to take on your way along the E39 from Oppedal to Lavik. Check the timetable here. A must do is the drive up to the top of Nibbevegen, the worlds highest fjord viewing platform 1,500 metres above Geirangerfjord. 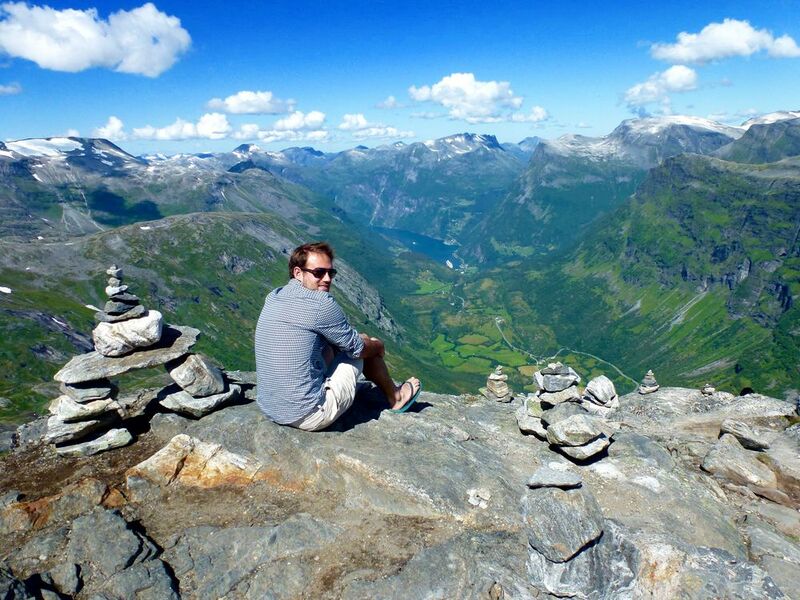 The platform has amazing views of Geiranger and the surrounding Norwegian Alps. Just be prepared for a very steep drive up! Ideally you will have three days in Geiranger but if not, it will be a tough choice between hiking and relaxing on a cruise down the fjord. The sightseeing cruise begins in Geiranger and takes you all the way down the fjord and lets you see waterfalls like the seven sisters and the sharp cliffs from the water. A day well spent if you are feeling on the lazy side. The most famous hike in Geiranger is to the abandoned farm of Skageflå which has amazing views of the fjord and the Seven Sisters Waterfall. The hike starts in Geiranger and it is a three hour walk to the farm (six hours return). Along the way you pass the the abandoned settlements of Homlungsætra and Homlong and get teasing views of the fjord through the thick trees. However, the real treat is your arrival to Skageflå as the trees disappear and you get an unimpeded view of the stunning fjord. If six hours is too long a hike then it is possible to get a boat to the base of Skageflå and then to walk three hours back to Geiranger. A much better option if you are hiking with kids (though it is a steep 700m climb to begin with). Sofnefjord is around a five and a half hour drive from Geiranger. The Sognefjord is the largest, longest and deepest fjord in Norway and is as deep as 1,300 metres in parts. Whilst it is a stunning fjord, the main section of the fjord is seriously wide and after visiting Geiranger it may not live up to expectations. However, there are some beautiful offshoots of the Sognefjord, including the UNESCO Nærøyfjord; a narrow fjord in the mould of Geiranger. Like all places in Norway, you could easily spend three days to a week here. Take one of the worlds most scenic train journeys from Flam to Myrdal and get stunning views of the Sognefjord and surrounding mountains. Cruise the Nærøyfjord for a sea view of the 1,700m peaks enclosing the fjord. As Sognefjord extends over such a large area there are many places to stay along the waters edge. However, we'd recommend Balestand (which housed the holiday home for the King of Norway in the 19th and 20th century). Balestand has all the amenities for tourists as well as being a central base to explore the region. Relax on a cruise around the Sognefjord, hike the surrounding mountains or even take a kayak out onto the water! Today is the day to drive back to Oslo. Whilst always a sad moment at the end a driving holiday, there will be many surprises around the corner on this drive back. The below photo, which was taken on an old iphone 5 (sorry for the grainy image), was at the top of a mountain pass on the way back to Oslo.